In the recent 2017 Promat show, mobile technology took the spotlight once again. This isn’t surprising, considering the opportunities that this technology brings to an industry that is always on the move. For companies that have adopted some form of mobile technology, the good news is you’re one step ahead considering that most of the industry is lagging in the adoption of this technology. As an adopter, you’ve established a clear competitive advantage over those that have fallen behind. In the "2017 MHI Annual Industry Report, Next-Generation Supply Chains: Digital, On-Demand and Always-On", 44% of respondents expressed that “wearable and mobile technology have the potential to either disrupt the industry or create competitive advantage”. 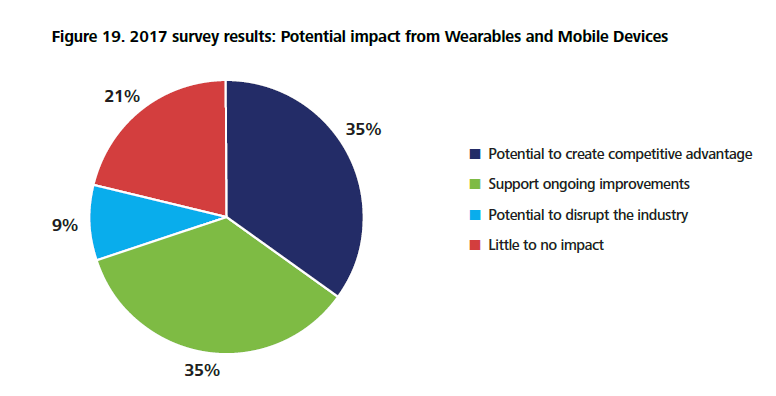 As per the rate at which companies are adopting mobile solutions, the same report shows that 22% of the respondents “are using wearables and mobile technology” and the predicted adoption rate is 45% within the next 1-2 years. See graph below for current and future utilization. The 2017 MHI Annual Industry Report also shows how mobility is being used to optimize and reduce errors across core warehousing processes. For example, 27% of the respondents expressed that they use mobile technology during the order picking process, 25% in receiving operations and 12% in cycle counting. So, what warehouse mobile solutions can small and mid-size organizations implement to reap these benefits? Let’s briefly review one at a time. 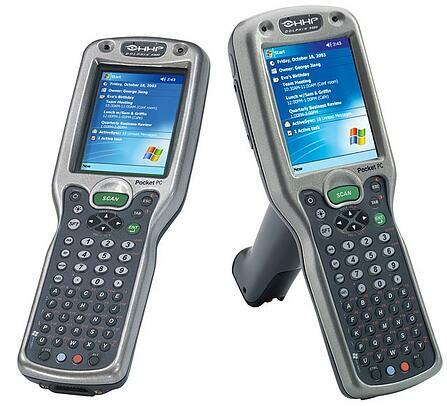 Handheld mobile computers are by far the most adopted mobile computing solution deployed across warehouses of all sizes. 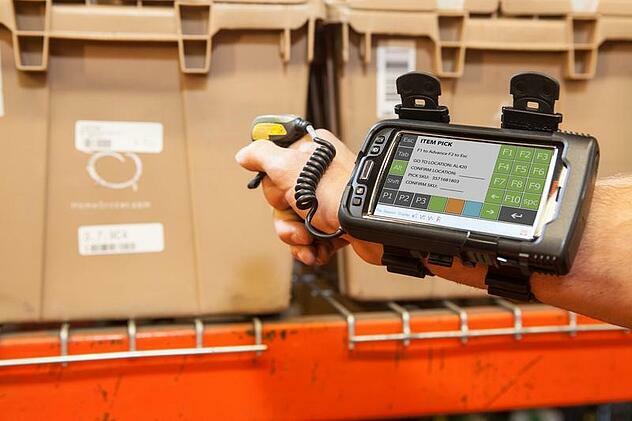 From receiving, to put-away to inventory, picking and shipping operations handheld mobile computers integrated with the WMS are the perfect solution to increase warehouse efficiency and improve accuracy across these critical operations. Most handheld mobile computers provide 1D or 2D barcode capabilities (the difference between the two lies in the ability to hold more data) and newer modules provide RFID capabilities. While standard RF barcode capabilities require pointing to the intended label, RFID capable devices just require waving the handheld in relative proximity of the cargo (between 15 to 30 ft. read ranges). By using long range or RFID capable handheld mobile computers forklift drivers can scan the desired cargo without having to get off the forklift and warehouse clerks can avoid using lifters or stairs – thus reducing task processing times and increasing productivity. Mobile printers are another excellent way to reduce walking time within the warehouse. They allow warehouse clerks to produce labels at the point of application, thus eliminating the need to walk to central printing stations – another opportunity to streamline warehouse operations. Mobile printers are particularly useful in receiving operations where goods need to be re-labeled. A time-motion study conducted by Zebra demonstrated that warehouse workers wearing these printers labeled pallets in “42 percent less time” when compared to using central printing stations (28.11 seconds compared to 49.74). See table below. Mobile printers can also help increase warehouse efficiency through the packing & shipping processes, where workers can instantaneously label packages and reduce errors caused by mislabeling cargo. This level of shipping accuracy allows companies to reduce the likelihood of attaching the wrong label to the wrong cargo and sending it to the wrong customer. This solution helps companies reduce the average industry error rate of 2.5 where typical shipping error costs range between $60 and $250 - error costs depend on warehouse labor and handling expenses among other things. Rugged tablets and vehicle mounted computers are another tool used to increase warehouse efficiency, reduce data collection time and provide access to systems from anywhere in the warehouse. 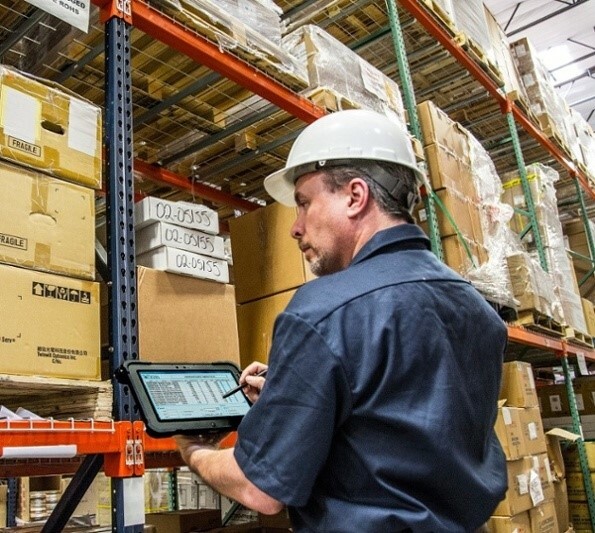 Rugged tablets are especially helpful to warehouse managers that need to be roaming around the warehouse while also needing access to performance metrics, customer emails, documents and more. These tablets come in many shapes and forms and support standard operating systems like Windows (thus allowing managers to work as if seated in front of the computer). They’re built to support the extreme working conditions of a warehouse (drops, high/low temperatures, humidity), thus protecting the financial investment and helping secure asset ROI. 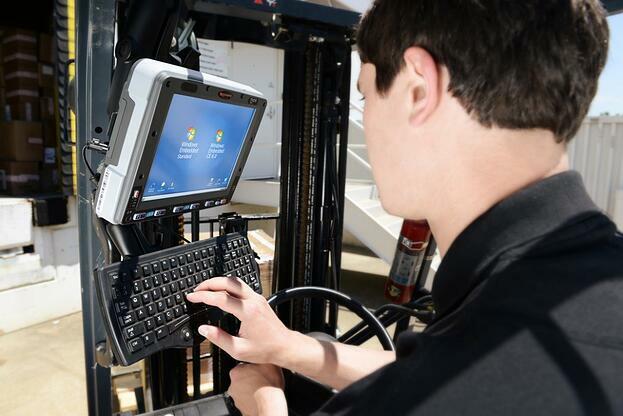 Vehicle mounted computers provide the same durability and protection of rugged tablets but are intended for the forklift operator. Forklifts equipped with mounted computers provide the operator with system access around the warehouse without having to get off the vehicle or having to go back to a central station. Last but not least, wearable computers are another warehouse mobile solution to consider when looking to optimize warehouse operations and create a safer working environment. Although most small and mid-size WMSs do not support wearable computers yet, it’s something to keep in mind when looking for a WMS – especially for intense picking operations where workers need to use both hands to safely pick the goods. Wearable computers extend to the regular worker some of the same capabilities and benefits that rugged tablets & vehicle mounted computers offer to the warehouse manager and forklift operators, but with one addition: safety. Regular warehouse workers (especially those in picking operations) can remain connected to warehouse management systems all around the warehouse while safely and efficiently picking cargo, without having to put aside the system or compromise their safety or the integrity of the good. The implementation of these wearable computers have been linked with error reductions up to 39% and increased operational speed resulting in up to 15% warehouse efficiency increase. Before wrapping up this article, it’s critical to mention the role that a well-implemented and reliable wireless warehouse network plays in ensuring warehouses can reap the full benefits of warehouse mobile technologies. With time-outs and others connectivity issues associated with an unreliable wireless network, mobile solutions will not effectively improve warehouse efficiency. So, by now it’s very clear why and how warehouse mobile solutions can help companies and warehouse managers run a more efficient warehouse operations. From reducing walking time, to increasing safety & system accessibility, and decreasing data collection latency, mobile solutions are a “must consider” strategy to increase productivity. As always, if there is anything else that you would like to know about this topic or if you need some tips for improving your warehouse operation do not hesitate to contact us.